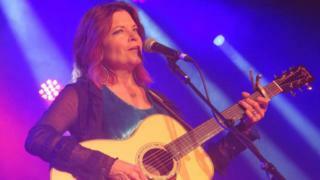 Image caption Rosanne Cash performed at the 54th Cambridge Folk Festival in the summer. The group behind the Cambridge Folk Festival has been given a £750,000 bailout from taxpayers. Cambridge City Council will take over the day-to-day running of Cambridge Live after the charity ran into financial difficulties. Cambridge Live was set up by the council in 2014 to run the Cambridge Corn Exchange, Cambridge Folk Festival and the Big Weekend. The council said it was "business as usual" and all tickets remained valid. Cambridge Live flagged up its financial struggles in June, when councillors agreed a £500,000 support package to keep it afloat and formulate a new business plan. Anna Smith, the Labour-run council's deputy leader, said a further £250,000 would be set aside to ensure Cambridge Live was "on a strong footing" and to cover the practicalities of transferring staff and services, which is expected to be complete by April. Ms Smith said: "Sadly, after much hard work with Cambridge Live it became apparent that they were not going to be able to meet their financial targets. This is why we have stepped in now." She acknowledged there would be an extra cost to taxpayers but said officers would find the money in the budget "in a sensible way". The full 2019 programme, including Corn Exchange shows, the Cambridge Folk Festival, the Big Weekend and other events, would continue as planned, the council said. Political opponents have called the cost of the bail-out "epic". Tim Bick, leader of the Liberal Democrat group on the council, said: "The vast majority of Cambridge Live's business has been to deliver on commissions for the council, so it is incredible that the council has let the costs of an emergency rescue get to this dizzying level before taking action." The 2018 Cambridge Folk Festival attracted more than 14,000 people over its four days.